When it comes to the world of beauty blogging, whether you're a blogger yourself or an avid reader (or both! ), there are times when you will come across the same products over and over again. From much loved classics such as Liz Earle's Cleanse & Polish to the new hyped 'must-have', like Revlon Lip Butters, there are just some products that will always be talked about. The main reason is that these items are usually Good. In fact, they're quite often Very Good. 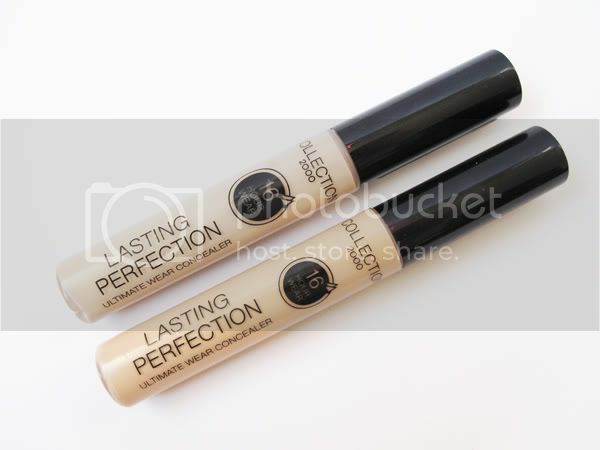 Case in point, Collection 2000's Lasting Perfection Concealer. You've probably seen this a million times before, you probably already have it in your make-up bag and use it every day. This concealer is like a legendary holy grail item for most women, it's that good. So when I used up my Witch Concealer Stick recently, the natural step seemed to be to acquire this holy concealer. Unlike most coveted beauty items, these concealers are purse-friendly and retail at a most bargain worthy £4.19. I swatched them in the shop and decided to get 02 Light and 03 Medium. Medium suits me perfectly for concealing blemishes and Light works well as an undereye concealer (if used extremely sparingly and blended in straight away. I'd say that these are definitely more suited for blemishes only in my opinion). 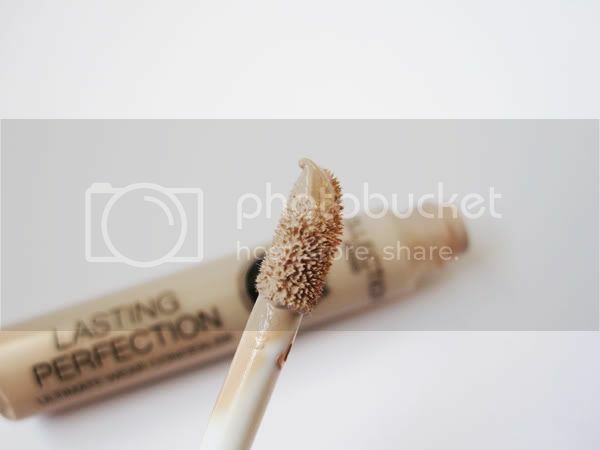 The concealers have a sponge tip applicator and due to the thick formula, you only need a teeny tiny amount to cover with. They blend into the skin really well and I was literally amazed by how well they conceal, I completely understand the hype now! As for wear, they promise up to 16 hours which I haven't put to the test yet, but so far, I've been wearing it for 9 and a bit hours and it hasn't budged once. 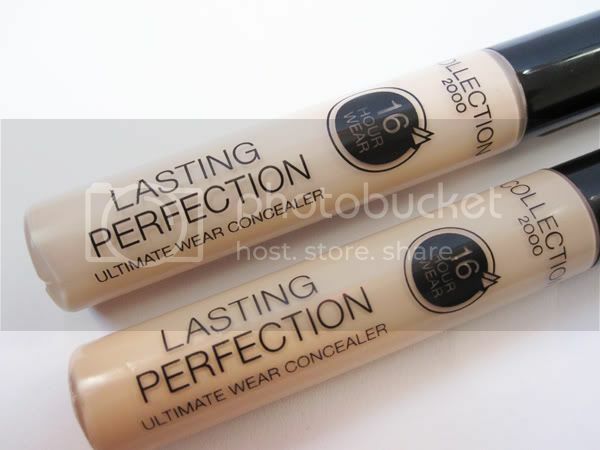 If you haven't tried Collection 2000's Lasting Perfection concealers yet and you're in the market to get a new concealer, just buy this. I don't think I'll ever go back to anything else now! I actually got my hands on this one and love it as well! Yes, I've read so much about this and indeed I need to try it. 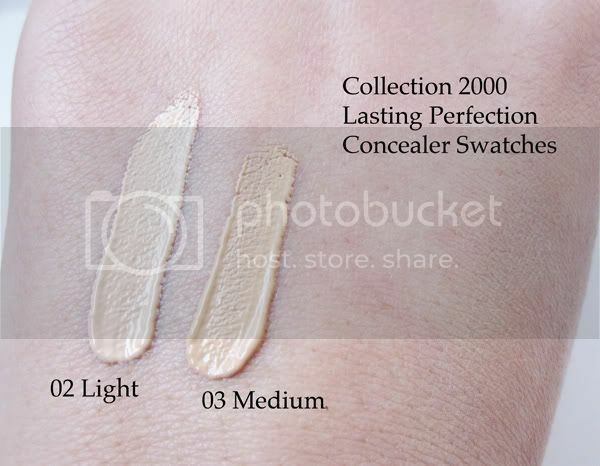 Just not sure on which shade to get...seeing your swatched I think medium is best for me. I just picked up my second tube of the stuff... I tried something else between tubes, but had to go out and buy a replacement, as anything else is feble is comparision.